PHOTOS: Fissures, Lava Flow And Evacuations Continue On Hawaii's Big Island : The Two-Way "This is not the time for sightseeing," the Hawaii County Civil Defense agency says. 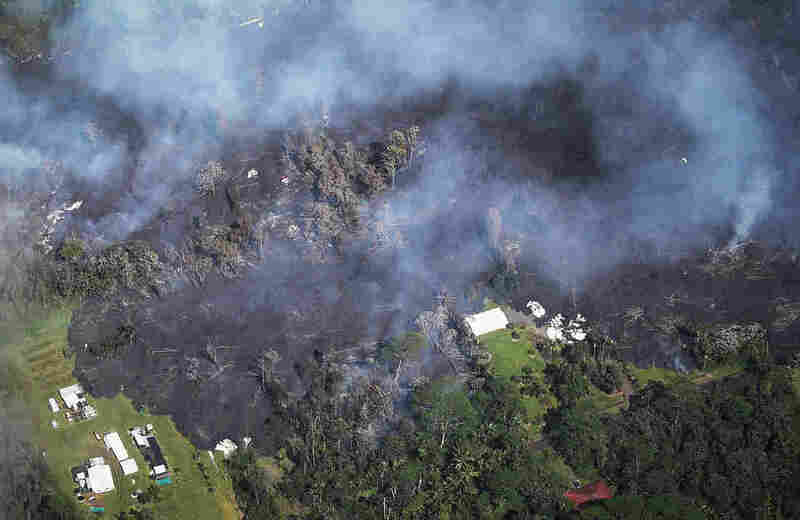 Some 35 structures have been destroyed by lava from 10 active fissures. Officials are also warning of toxic gases. A lava flow moves on Makamae Street in the Leilani Estates subdivision on Sunday, following an eruption by Hawaii's Kilauea volcano. The governor of Hawaii has declared a local state of emergency and some 1,700 residents have been ordered to flee. A volcanic eruption on Hawaii's Big Island continues to spew lava and toxic gases into a residential neighborhood, days after the shift in volcanic activity first prompted evacuations. Some 35 structures — including at least 26 homes — have been destroyed and there are now 10 active fissures, according to the Hawaii County Civil Defense agency. More than 1,700 people have been ordered to evacuate their homes. The Hawaiian Volcano Observatory said Sunday that the lava flow from the Kilauea volcano has traveled more than half a mile, and aftershocks continue to shake the region. 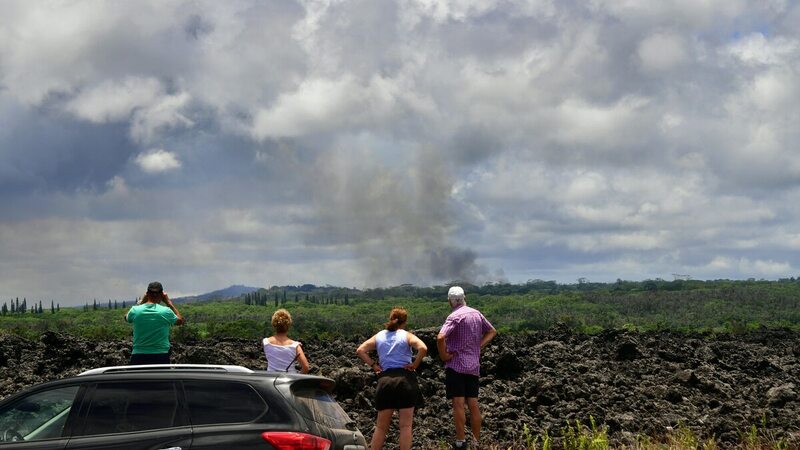 On Monday, the HVO said two new fissure segments had broken the surface — one in a forested area southwest of Leilani Estates, which was active for about 3 hours and a second near pre-existing fissures. Jackie Young of Hawaii Public Radio reports that some lava fountains were spewing molten rock 230 feet high. 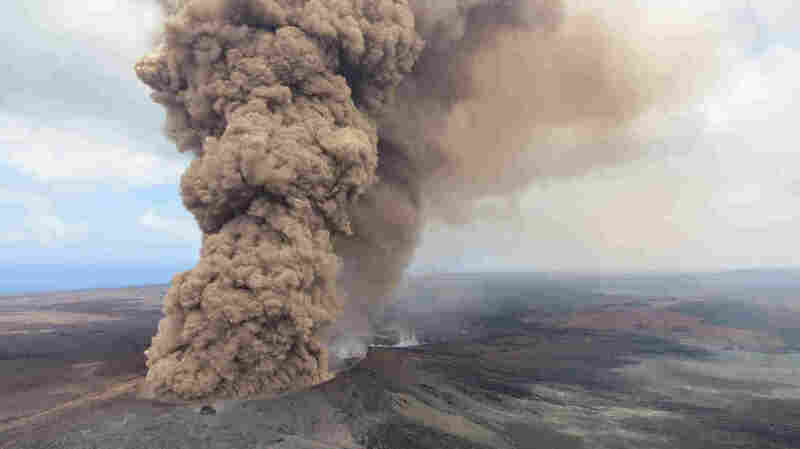 "Authorities emphasized that the eruption remains dangerous and constantly changing," Young reports. "Warnings were also reiterated about the toxic levels of sulfur dioxide gas. Some first responders have already become sickened from exposure." 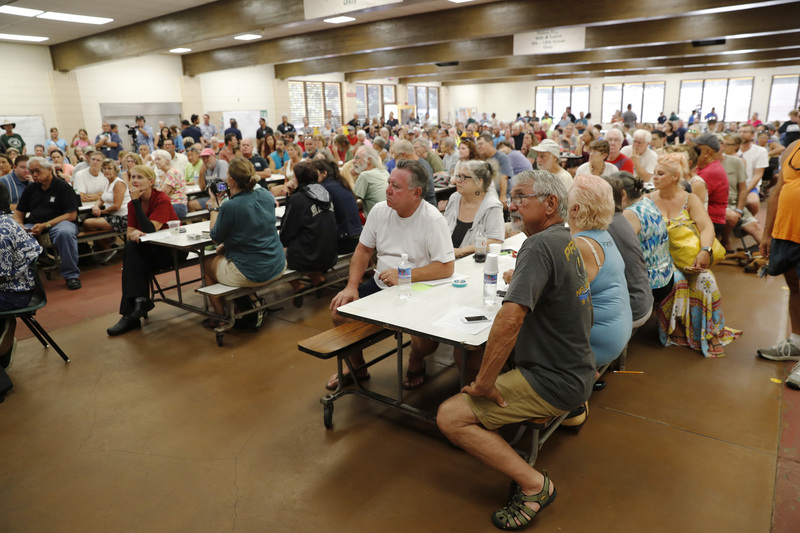 Residents from the lava-affected areas attend a community meeting at Pahoa High School in Pahoa on Friday. She adds: "So far, more than 200 residents and their pets have sought refuge in two Red Cross shelters, while hundreds more are staying with family and friends." Some residents of Leilani Estates, the neighborhood where the active eruption is located, are being permitted to check on their property during the day, "conditions permitting," the county's civil defense agency writes. The civil defense shared information about hazardous volcanic air pollution — known as "vog" — with Hawaii residents. The pollution is made up of acidic gases and particles, mostly sulfur dioxide and related chemicals. "Communities downwind from Kīlauea Volcano's active vents frequently experience vog as a visible haze or as a sulfurous smell or taste," the county wrote in an update several years ago. "People exposed to vog report a variety of symptoms, such as eye irritation, coughing, wheezing, sore throats and headaches." 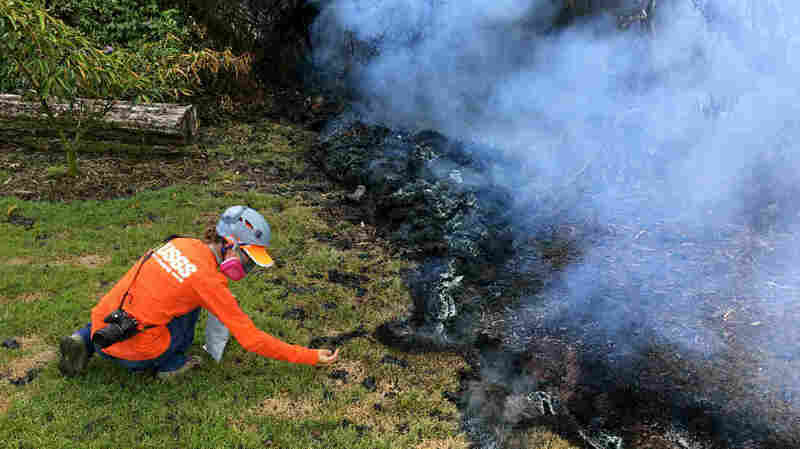 "Amber Makuakane Kane, 37, a teacher and single mother of two, said her three-bedroom house in Leilani Estates was destroyed by lava. "The dwelling was across from a fissure that opened Friday, when 'there was some steam rising from all parts of the yard, but everything looked fine,' Makuakane said. "On Saturday, she received alerts from her security system that motion sensors throughout the house had been triggered. She later confirmed that lava had covered her property. "Makuakane grew up in the area and lived in her house for nine years. 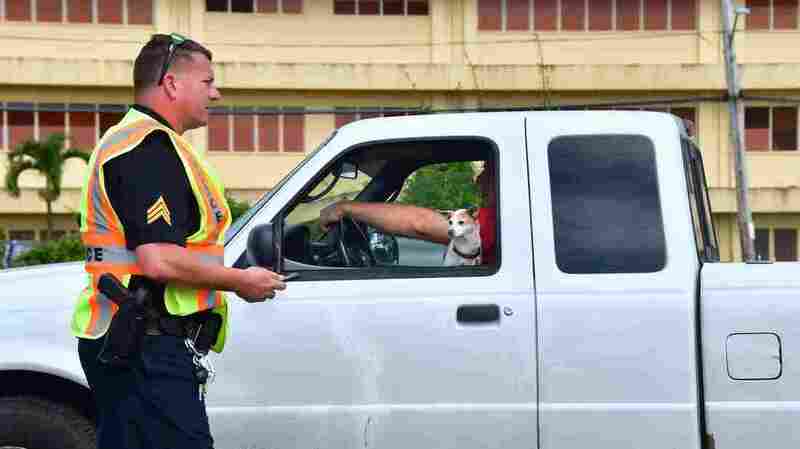 Her parents also live in Leilani Estates.
" 'The volcano and the lava — it's always been a part of my life,' she said. 'It's devastating ... but I've come to terms with it.' "
A Hawaiian Volcano Observatory geologist collects samples of spatter for laboratory analysis on Sunday in the Leilani Estates subdivision near Pahoa. "Please be aware that because of unstable conditions that involve toxic gas, earthquakes and lava activities, lines of safety can change at any time," the civil defense says. "You must be prepared to leave areas if required." Nonresidents were being discouraged from traveling toward the eruption. People stop on the side of the road to view a plume of smoke rising over Leilani Estates on Sunday. "This is not the time for sightseeing," the civil defense writes. "You can help tremendously by staying out of the area." Kilauea has been "erupting continuously since 1983," as Hawaii Public Radio noted several years ago. But the pattern of eruption shifts, sometimes dramatically. A column of thick, reddish-brown ash rises in the air on Friday, after a magnitude 6.9 earthquake shook Hawaii's Big Island. "Babb explained that the rumbling in the region goes back to mid-March when the cone of the Pu'u O'o crater began to swell and the pressure trapped inside caused the crater floor to collapse on April 30. That forced an intrusion of the magma, which means that rather than gushing upward through the crater of the volcano, it starting seeping underground. "As it moves beneath the surface, the molten lava is breaking up rock and causing the ground to shift." That movement causes earthquakes — and new fissures. Evacuees returned to their Leilani Estates homes on Sunday to gather their belongings and then leave again. The Kilauea volcano, the most active in Hawaii, was highly unstable over the weekend as lava spouted into the air and fissures emitted deadly gases. It's not clear how long the active lava flow in Leilani Estates will continue. But residents might be pushed out of their homes for a lengthy period of time. In 1955, a Kilauea eruption lasted 88 days, Babb noted. Hawaii County Mayor Harry Kim told Hawaii News Now that the county will house and feed evacuees for "as long as we need to." Lava from volcanic fissures slowly advances and overtakes structures and trees in the Leilani Estates neighborhood on Sunday. 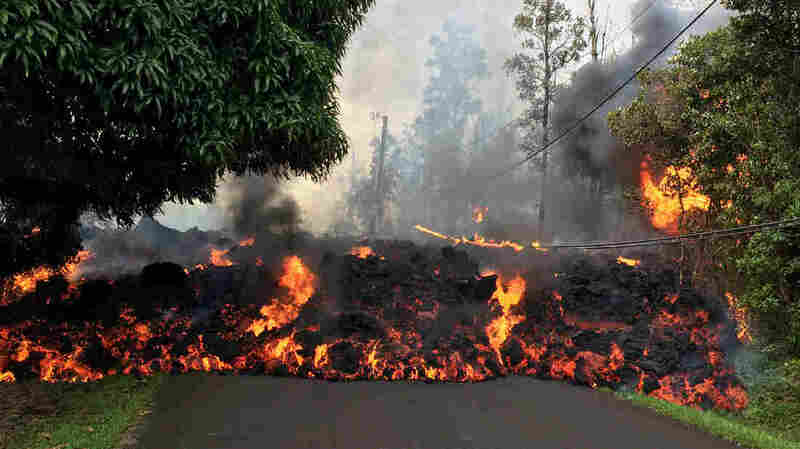 At least 26 homes have been destroyed by lava. Photo editor Eslah Attar contributed to this post.